That's Pier Angeli and a dismounting Stanley Baker behind Anouk. 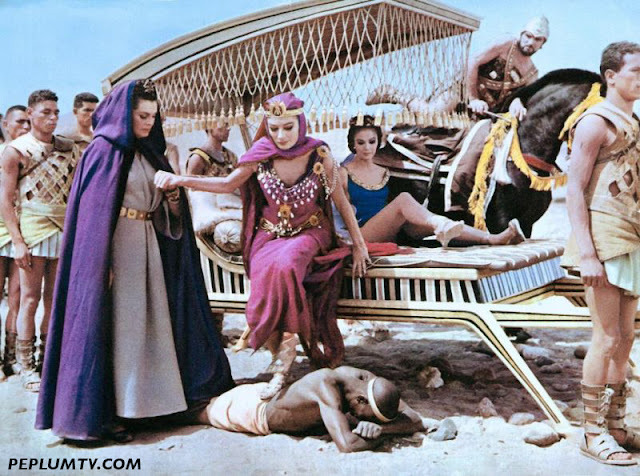 The slave at her feet is uncredited. I doubt a roman litter looked like that back in the day but it makes for an entertaining presentation. It just doesn't cover enough, certainly with a scorching sun above. I also don't think roman litters were called roman litters when this story took place, just litter. The mileage on this must be very low. Interesting photo; I agree fully with your comments. As you once noted perceptively, whenever a Patrician lady arrived in a litter in a film set in the Roman Empire she was almost certainly a villain. Often this role was played by Gianna Maria Canale (my secret heart throb!). Later on in the movie Gianna will most likely be cruel to her slavegirl, often due to a love triangle.